Didn't feel like just taking the train back to Hanoi, so I got on a rickety local bus south to a big lake, at Thac Ba. It's so off the tourist trail that it took me an hour to find a hotel - not labeled as such of course - ignoring several locals explaining that no hotels exist but fortunately they could offer an enormously expensive scooter ride to Yen Bai an hour away. No thanks. The reward was a village completely unspoiled by tourism. No souvenirs can be bought there. Walking a few minutes in any direction put me into valleys, fields, or to the lake, or the river leading there. As usual in small villages, I was quickly surrounded by curious people, where one half wanted me to take pictures of the other half. English not needed for having fun. Bac Ha is much more impressive than Sapa. Trails run along the mountainsides, high above the valleys with great views. There are fewer villages up there but I had a great guide, Hung, who comes from a minority village himself and got us invited into numerous private homes. The houses of the Flower H'Mong tribe, so called because of the women's colorful dresses, are built from clay and wood, with a packed dirt floor, subdivided with curtains. There is an open fire - but no chimney - and a ladder to upstairs storage for rice and beans. There is always hot tea and a bamboo water pipe with tobacco for guests. Only the very old and the very young stay at home; everyone else is out tending the fields on the mountainsides, harvesting or plowing with a buffalo. Not an easy life! 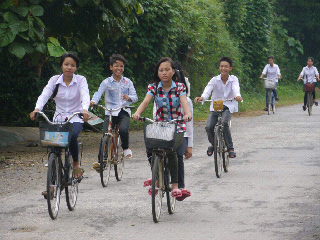 The countryside around Bac Ha is a vertical version of Sapa. Roads wind along the edges of mountains, with beautiful views of valleys and endless ladders of rice terrace upon rice terrace. 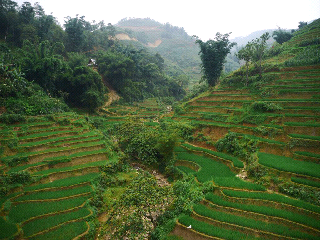 Scattered between them are the minority villages, just as poor as the ones near Sapa. They build with mud walls here though. The roads are little more than rocky trails, a serious challenge for motorcycles. Bac Ha is mostly known for its Sunday market, the biggest in the area. Day tourists come here from Sapa, but it's much quieter before they arrive because few people overnight here. It's full of minority women in their colorful multilayered dresses, selling to the locals - although souvenir stalls have begun to line the entrances. There are clothes, tools, animals, meat, and anything else made or used locally on sale, plus numerous eateries.